Document is in BETA. It may be incomplete and/or inaccurate. Post suggestions to the Comments section and be sure to read about updates also within the Comments section. This exploratory tutorial provides instructions and example data to map short reads to a reference genome with alternate haplotypes. Instructions are suitable for indexing and mapping reads to GRCh38. ► If you are unfamiliar with terms that describe reference genome components, or GRCh38 alternate haplotypes, take a few minutes to study the Dictionary entry Reference Genome Components. ► For an introduction to GRCh38, see Blog#8180. 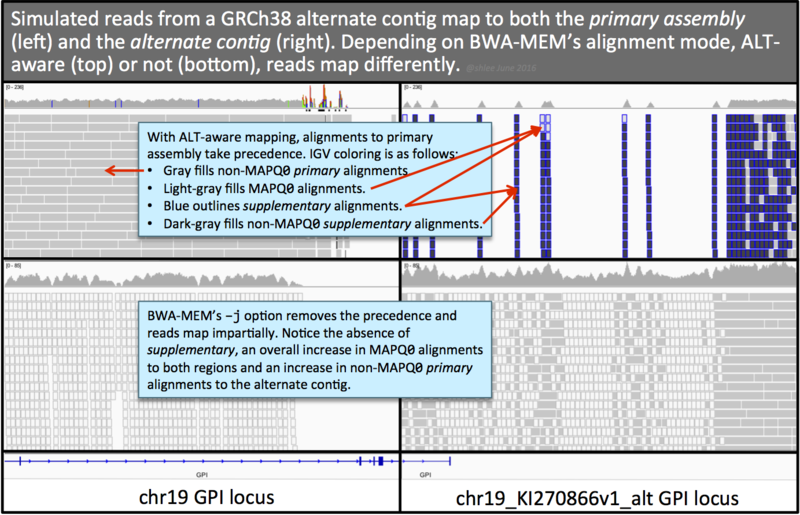 Specifically, the tutorial uses BWA-MEM to index and map simulated reads for three samples to a mini-reference composed of a GRCh38 chromosome and alternate contig (sections 1–3). We align in an alternate contig aware (alt-aware) manner, which we also call alt-handling. This is the main focus of the tutorial. The decision to align to a genome with alternate haplotypes has implications for variant calling. We discuss these in section 5 using the callset generated with the optional tutorial steps outlined in section 4. Because we strategically placed a number of SNPs on the sequence used to simulate the reads, in both homologous and divergent regions, we can use the variant calls and their annotations to examine the implications of analysis approaches. To this end, the tutorial fast-forwards through pre-processing and calls variants for a trio of samples that represents the combinations of the two reference haplotypes (the PA and the ALT). This first workflow (tutorial_8017) is suitable for calling variants on the primary assembly but is insufficient for capturing variants on the alternate contigs. The tutorial ends by comparing the difference in call qualities from the multiple workflows for the given example data and discusses a few caveats of each approach. ► The three workflows shown in the diagram above are available as WDL scripts in our GATK Tutorials WDL scripts repository. ☞ What happens if I forget the ALT index file? ☞ How can I tell if a BAM was aligned with alt-handling? ☞ What is the pa tag? How can I tell whether I should consider an alternate haplotype for a given sample? My locus includes an alternate haplotype. How can I call variants on alt contigs? BWA v0.7.13 or later releases. The tutorial uses v0.7.15. Download from here and see Tutorial#2899 for installation instructions. The bwa-postalt.js script is within the bwakit folder. Picard tools v2.5.0 or later releases. The tutorial uses v2.5.0. Optional GATK tools. The tutorial uses v3.6. Optional Samtools. The tutorial uses v1.3.1. Optional Gawk, an AWK-like tool that can interpret bitwise SAM flags. The tutorial uses v4.1.3. Download tutorial_8017.tar.gz, either from the GoogleDrive or from the ftp site. To access the ftp site, leave the password field blank. The data tarball contains the paired FASTQ reads files for three samples. It also contains a mini-reference chr19_chr19_KI270866v1_alt.fasta and corresponding .dict dictionary, .fai index and six BWA indices including the .alt index. The data tarball includes the output files from the workflow that we care most about. These are the aligned SAMs, processed and indexed BAMs and the final multisample VCF callsets from the three presented workflows. The mini-reference contains two contigs subset from human GRCh38: chr19 and chr19_KI270866v1_alt. The ALT contig corresponds to a diverged haplotype of chromosome 19. Specifically, it corresponds to chr19:34350807-34392977, which contains the glucose-6-phosphate isomerase or GPI gene. 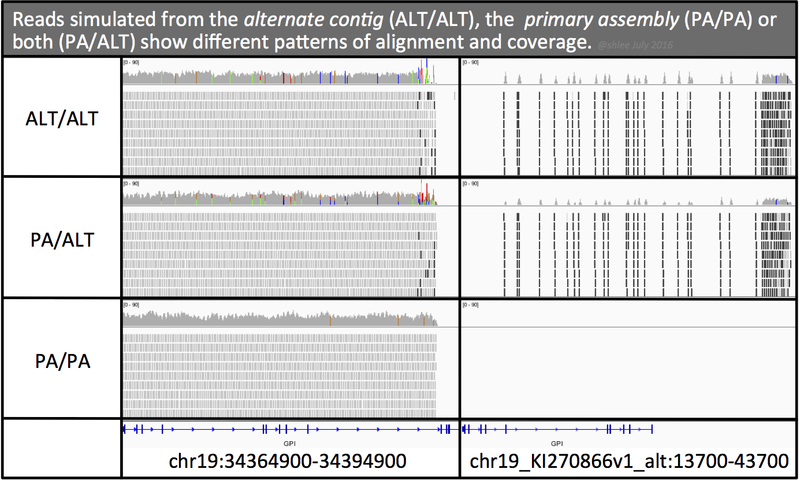 Part of the ALT contig introduces novel sequence that lacks a corresponding region in the primary assembly. Using instructions in Tutorial#7859, we simulated paired 2x151 reads to derive three different sample reads that when aligned give roughly 35x coverage for the target primary locus. We derived the sequences from either the 43 kbp ALT contig (sample ALTALT), the corresponding 42 kbp region of the primary assembly (sample PAPA) or both (sample PAALT). Before simulating the reads, we introduced four SNPs to each contig sequence in a deliberate manner so that we can call variants. ► Alternatively, you may instead use the example input files and commands with the full GRCh38 reference. Results will be similar with a handful of reads mapping outside of the mini-reference regions. Our example chr19_chr19_KI270866v1_alt.fasta reference already has chr19_chr19_KI270866v1_alt.dict dictionary and chr19_chr19_KI270866v1_alt.fasta.fai index files for use with Picard and GATK tools. BWA requires a different set of index files for alignment. The command below creates five of the six index files we need for alignment. The command calls the index function of BWA on the reference FASTA. This gives .pac, .bwt, .ann, .amb and .sa index files that all have the same chr19_chr19_KI270866v1_alt.fasta basename. Tools recognize index files within the same directory by their identical basename. In the case of BWA, it uses the basename preceding the .fasta suffix and searches for the index file, e.g. with .bwt suffix or .64.bwt suffix. Depending on which of the two choices it finds, it looks for the same suffix for the other index files, e.g. .alt or .64.alt. Lack of a matching .alt index file will cause BWA to map reads without alt-handling. More on this next. Note that the .64. part is an explicit indication that index files were generated with version 0.6 or later of BWA and are the 64-bit indices (as opposed to files generated by earlier versions, which were 32-bit). This .64. signifier can be added automatically by adding -6 to the bwa index command. Be sure to place the tutorial's mini-ALT index file chr19_chr19_KI270866v1_alt.fasta.alt with the other index files. Also, if it does not already match, change the file basename to match. This is the sixth index file we need for alignment. 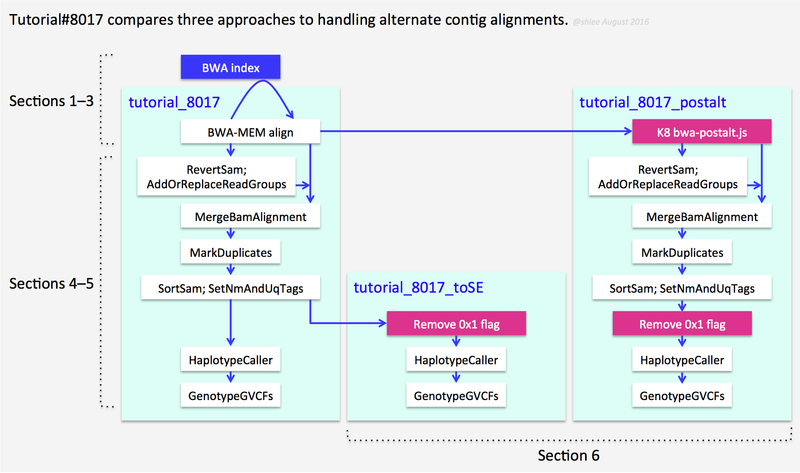 BWA-MEM uses this file to prioritize primary assembly alignments for reads that can map to both the primary assembly and an alternate contig. See BWA documentation for details. As of this writing (August 8, 2016), the SAM format ALT index file for GRCh38 is available only in the x86_64-linux bwakit download as stated in this bwakit README. The hs38DH.fa.alt file is in the resource-GRCh38 folder. In addition to mapped alternate contig records, the ALT index also contains decoy contig records as unmapped SAM records. This is relevant to the postalt-processing we discuss in section 6.2. As such, the postalt-processing in section 6 also requires the ALT index. For the tutorial, we subset from hs38DH.fa.alt to create a mini-ALT index, chr19_chr19_KI270866v1_alt.fasta.alt. Its contents are shown below. The record aligns the chr19_KI270866v1_alt contig to the chr19 locus starting at position 34,350,807 and uses CIGAR string nomenclature to indicate the pairwise structure. To interpret the CIGAR string, think of the primary assembly as the reference and the ALT contig sequence as the read. For example, the 11307M at the start indicates 11,307 corresponding sequence bases, either matches or mismatches. The 935S at the end indicates a 935 base softclip for the ALT contig sequence that lacks corresponding sequence in the primary assembly. This is a region that we consider highly divergent or novel. Finally, notice the NM tag that notes the edit distance to the reference. If you omit the ALT index file from the reference, or if its naming structure mismatches the other indexes, then your alignments will be equivalent to the results you would obtain if you run BWA-MEM with the -j option. The next section gives an example of what this looks like. The command below uses an alt-aware version of BWA and maps reads using BWA's maximal exact match (MEM) option. Because the ALT index file is present, the tool prioritizes mapping to the primary assembly over ALT contigs. In the command, the tutorial's chr19_chr19_KI270866v1_alt.fasta serves as reference; one FASTQ holds the forward reads and the other holds the reverse reads. The resulting file 8017_bwamem.sam contains aligned read records. BWA preferentially maps to the primary assembly any reads that can align equally well to the primary assembly or the ALT contigs as well as any reads that it can reasonably align to the primary assembly even if it aligns better to an ALT contig. Preference is given by the primary alignment record status, i.e. not secondary and not supplementary. BWA takes the reads that it cannot map to the primary assembly and attempts to map them to the alternate contigs. If a read can map to an alternate contig, then it is mapped to the alternate contig as a primary alignment. 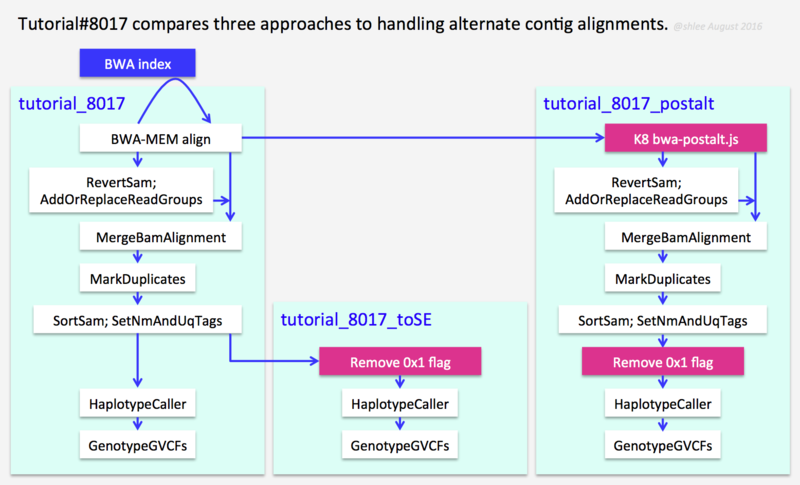 For those reads that can map to both and align better to the ALT contig, the tool flags the ALT contig alignment record as supplementary (0x800). This is what we call alt-aware mapping or alt-handling. Adding the -j option to the command disables the alt-handling. 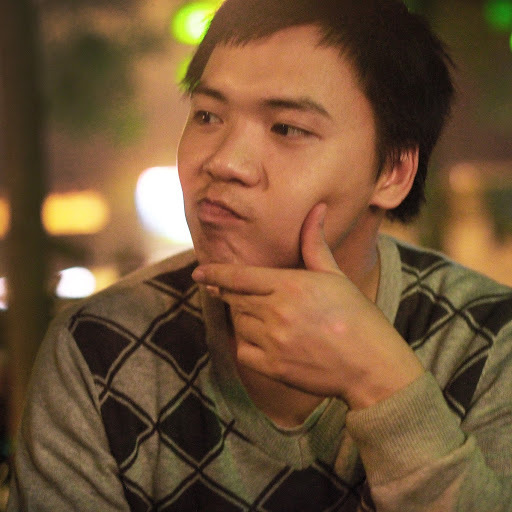 Reads that can map multiply are given low or zero MAPQ scores. There are two approaches to this question. First, you can view the alignments on IGV and compare primary assembly loci with their alternate contigs. The IGV screenshots to the right show how BWA maps reads with (top) or without (bottom) alt-handling. Second, you can check the alignment SAM. Of two tags that indicate alt-aware alignment, one will persist after preprocessing only if the sample has reads that can map to alternate contigs. The first tag, the AH tag, is in the BAM header section of the alignment file, and is absent after any merging step, e.g. merging with MergeBamAlignment. The second tag, the pa tag, is present for reads that the aligner alt-handles. If a sample does not contain any reads that map equally or preferentially to alternate contigs, then this tag may be absent in a BAM even if the alignments were mapped in an alt-aware manner. Here are three headers for comparison where only one indicates alt-aware alignment. File header for alt-aware alignment. We use this type of alignment in the tutorial. Each alternate contig's @SQ line in the header will have an AH:* tag to indicate alternate contig handling for that contig. This marking is based on the alternate contig being listed in the .alt index file and alt-aware alignment. File header for -j alignment (alt-handling disabled) for example purposes. We do not perform this type of alignment in the tutorial. Notice the absence of any special tags in the header. File header for alt-aware alignment after merging with MergeBamAlignment. We use this step in the next section. Again, notice the absence of any special tags in the header. For BWA v0.7.15, but not v0.7.13, ALT loci alignment records that can align to both the primary assembly and alternate contig(s) will have a pa tag on the primary assembly alignment. For example, read chr19_KI270866v1_alt_4hetvars_26518_27047_0:0:0_0:0:0_931 of the ALTALT sample has five alignment records only three of which have the pa tag as shown below. The pa tag measures how much better a read aligns to its best alternate contig alignment versus its primary assembly (pa) alignment. Specifically, it is the ratio of the primary assembly alignment score over the highest alternate contig alignment score. In our example we have primary assembly alignment scores of 146, 120 and 54 and alternate contig alignment scores of 151 and again 151. This gives us three different pa scores that tag the primary assembly alignments: 146/151=0.967, 120/151=0.795 and 54/151=0.358. In our tutorial's workflow, MergeBamAlignment may either change an alignment's pa score or add a previously unassigned pa score to an alignment. The result of this is summarized as follows for the same alignments. If you want to retain the BWA-assigned pa scores, then add the following options to the workflow commands in section 4. In our sample set, after BWA-MEM alignment ALTALT has 1412 pa-tagged alignment records, PAALT has 805 pa-tagged alignment records and PAPA has zero pa-tagged records. The initial alignment file is missing read group information. One way to add that information, which we use in production, is to use MergeBamAlignment. MergeBamAlignment adds back read group information contained in an unaligned BAM and adjusts meta information to produce a clean BAM ready for pre-processing (see Tutorial#6483 for details on our use of MergeBamAlignment). Given the focus here is to showcase BWA-MEM's alt-handling, we refrain from going into the details of all this additional processing. They follow, with some variation, the PairedEndSingleSampleWf pipeline detailed here. Remember these are simulated reads with simulated base qualities. We simulated the reads in a manner that only introduces the planned mismatches, without any errors. Coverage is good at roughly 35x. All of the base qualities for all of the reads are at I, which is, according to this page and this site, an excellent base quality score equivalent to a Sanger Phred+33 score of 40. We can therefore skip base quality score recalibration (BQSR) since the reads are simulated and the dataset is not large enough for recalibration anyway. Here are the commands to obtain a final multisample variant callset. The commands are given for one of the samples. Process each of the three samples independently in the same manner [4.1–4.6] until the last GenotypeGVCFs command [4.7]. 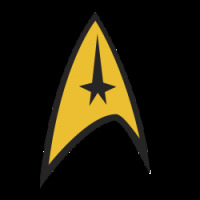 As of Picard v2.7.0, released October 17, 2016, SetNmAndUqTags is no longer available. Use SetNmMdAndUqTags instead. The altalt_snaut.bam, HaplotypeCaller's altalt_hc.bam and the multisample multisample.vcf are ready for viewing on IGV. Before getting into the results in the next section, we have minor comments on two filtering options. In our tutorial workflows, we turn off MergeBamAlignment's UNMAP_CONTAMINANT_READS option. If set to true, 68 reads become unmapped for PAPA and 40 reads become unmapped for PAALT. These unmapped reads are those reads caught by the UNMAP_CONTAMINANT_READS filter and their mates. MergeBamAlignment defines contaminant reads as those alignments that are overclipped, i.e. that are softclipped on both ends, and that align with less than 32 bases. Changing the MIN_UNCLIPPED_BASES option from the default of 32 to 22 and 23 restores all of these reads for PAPA and PAALT, respectively. Contaminants are obviously absent for these simulated reads. And so we set UNMAP_CONTAMINANT_READS to false to disable this filtering. HaplotypeCaller's --read_filter OverclippedRead option similarly looks for both-end-softclipped alignments, then filters reads aligning with less than 30 bases. The difference is that HaplotypeCaller only excludes the overclipped alignments from its calling and does not remove mapping information nor does it act on the mate of the filtered alignment. Thus, we keep this read filter for the first workflow. However, for the second and third workflows in section 6, tutorial_8017_toSE and tutorial_8017_postalt, we omit the --read_filter Overclipped option from the HaplotypeCaller command. We also omit the --max_alternate_alleles 3 option for simplicity. 5. How can I tell whether I should consider an alternate haplotype? We consider this question only for our GPI locus, a locus we know has an alternate contig in the reference. Here we use the term locus in its biological sense to refer to a contiguous genomic region of interest. The three samples give the alignment and coverage profiles shown on the right. What is immediately apparent from the IGV screenshot is that the scenarios that include the alternate haplotype give a distinct pattern of variant sites to the primary assembly much like a fingerprint. These variants are predominantly heterozygous or homozygous. Looking closely at the 3' region of the locus, we see some alignment coverage anomalies that also show a distinct pattern. The coverage in some of the highly diverged region in the primary assembly drops while in others it increases. If we look at the origin of simulated reads in one of the excess coverage regions, we see that they are from two different regions of the alternate contig that suggests duplicated sequence segments within the alternate locus. The variation pattern and coverage anomalies on the primary locus suggest an alternate haplotype may be present for the locus. We can then confirm the presence of aligned reads, both supplementary and primary, on the alternate locus. Furthermore, if we count the alignment records for each region, e.g. using samtools idxstats, we see the following metrics. The number of alignments on the alternate locus increases proportionately with alternate contig dosage. All of these factors together suggest that the sample presents an alternate haplotype. The three-sample variant callset gives 54 sites on the primary locus and two additional on the alternate locus for 56 variant sites. All of the eight SNP alleles we introduced are called, with six called on the primary assembly and two called on the alternate contig. Of the 15 expected genotype calls, four are incorrect. Namely, four PAALT calls that ought to be heterozygous are called homozygous variant. These are two each on the primary assembly and on the alternate contig in the region that is highly divergent. ► Our production pipelines use genomic intervals lists that exclude GRCh38 alternate contigs from variant calling. That is, variant calling is performed only for contigs of the primary assembly. This calling on even just the primary assembly of GRCh38 brings improvements to analysis results over previous assemblies. For example, if we align and call variants for our simulated reads on GRCh37, we call 50 variant sites with identical QUAL scores to the equivalent calls in our GRCh38 callset. However, this GRCh37 callset is missing six variant calls compared to the GRCh38 callset for the 42 kb locus: the two variant sites on the alternate contig and four variant sites on the primary assembly. Consider the example variants on the primary locus. The variant calls from the primary assembly include 32 variant sites that are strictly homozygous variant in ALTALT and heterozygous variant in PAALT. The callset represents only those reads from the ALT that can be mapped to the primary assembly. In contrast, the two variants in regions whose reads can only map to the alternate contig are absent from the primary assembly callset. For this simulated dataset, the primary alignments present on the alternate contig provide enough supporting reads that allow HaplotypeCaller to call the two variants. However, these variant calls have lower-quality annotation metrics than for those simulated in an equal manner on the primary assembly. We will get into why this is in section 6. Additionally, for our PAALT sample that is heterozygous for an alternate haplotype, the genotype calls in the highly divergent regions are inaccurate. These are called homozygous variant on the primary assembly and on the alternate contig when in fact they are heterozygous variant. These calls have lower genotype scores GQ as well as lower allele depth AD and coverage DP. The table below shows the variant calls for the introduced SNP sites. In blue are the genotype calls that should be heterozygous variant but are instead called homozygous variant. 6. My locus includes an alternate haplotype. How can I call variants on alt contigs? If you want to call variants on alternate contigs, consider additional data processing that overcome the following problems. Loss of alignments from filtering of overclipped reads. HaplotypeCaller's filtering of alignments whose mates map to another contig. Alt-handling produces many of these types of reads on the alternate contigs. Zero MAPQ scores for alignments that map to two or more alternate contigs. HaplotypeCaller excludes these types of reads from contributing to evidence for variation. Let us talk about these in more detail. Ideally, if we are interested in alternate haplotypes, then we would have ensured we were using the most up-to-date analysis reference genome sequence with the latest patch fixes. Also, whatever approach we take to align and preprocess alignments, if we filter any reads as putative contaminants, e.g. with MergeBamAlignment's option to unmap cross-species contamination, then at this point we would want to fish back into the unmapped reads pool and pull out those reads. Specifically, these would have an SA tag indicating mapping to the alternate contig of interest and an FT tag indicating the reason for unmapping was because MergeBamAlignment's UNMAP_CONTAMINANT_READS option identified them as cross-species contamination. Similarly, we want to make sure not to include HaplotypeCaller's --read_filter OverclippedRead option that we use in the first workflow. As section 5.1 shows, variant calls on the alternate contig are of low quality--they have roughly an order of magnitude lower QUAL scores than what should be equivalent variant calls on the primary assembly. For this exploratory tutorial, we are interested in calling the introduced SNPs with equivalent annotation metrics. Whether they are called on the primary assembly or the alternate contig and whether they are called homozygous variant or heterozygous--let's say these are less important, especially given pinning certain variants from highly homologous regions to one of the loci is nigh impossible with our short reads. To this end, we will use the second workflow shown in the workflows diagram. However, because this solution is limited, we present a third workflow as well. ► We present these workflows solely for exploratory purposes. They do not represent any production workflows. Tutorial_8017_toSE uses the processed BAM from our first workflow and allows for calling on singular alternate contigs. That is, the workflow is suitable for calling on alternate contigs of loci with only a single alternate contig like our GPI locus. Tutorial_8017_postalt uses the aligned SAM from the first workflow before processing, and requires separate processing before calling. This third workflow allows for calling on all alternate contigs, even on HLA loci that have numerous contigs per primary locus. However, the callset will not be parsimonious. That is, each alternate contig will greedily represent alignments and it is possible the same variant is called for all the alternate loci for a given primary locus as well as on the primary locus. It is up to the analyst to figure out what to do with the resulting calls. The reason for the divide in these two workflows is in the way BWA assigns mapping quality scores (MAPQ) to multimapping reads. Postalt-processing becomes necessary for loci with two or more alternate contigs because the shared alignments between the primary locus and alternate loci will have zero MAPQ scores. Postalt-processing gives non-zero MAPQ scores to the alignment records. The table presents the frequencies of GRCh38 non-HLA alternate contigs per primary locus. It appears that ~75% of non-HLA alternate contigs are singular to ~92% of primary loci with non-HLA alternate contigs. 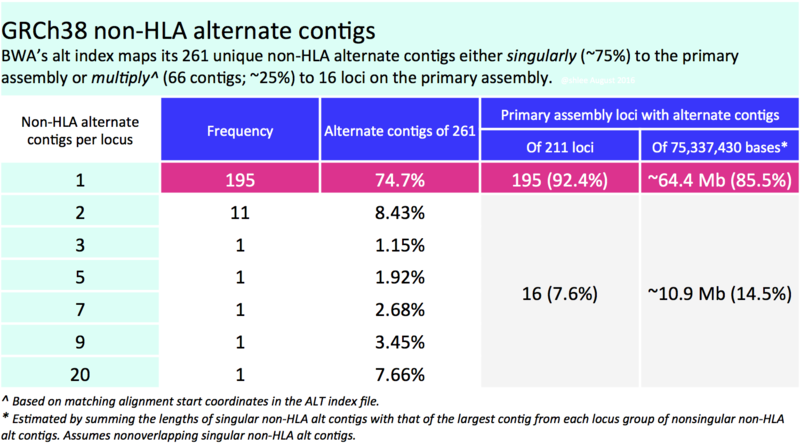 In terms of bases on the primary assembly, of the ~75 megabases that have alternate contigs, ~64 megabases (85%) have singular non-HLA alternate contigs and ~11 megabases (15%) have multiple non-HLA alternate contigs per locus. Our tutorial's example locus falls under this majority. In both alt-aware mapping and postalt-processing, alternate contig alignments have a predominance of mates that map back to the primary assembly. HaplotypeCaller, for good reason, filters reads whose mates map to a different contig. However, we know that GRCh38 artificially represents alternate haplotypes as separate contigs and BWA-MEM intentionally maps these mates back to the primary locus. For comparable calls on alternate contigs, we need to include these alignments in calling. To this end, we have devised a temporary workaround. Here we are only aiming for equivalent calls with similar annotation values for the two variants that are called on the alternate contig. For the solution that we will outline, here are the results. Including the mate-mapped-to-other-contig alignments bolsters the variant call qualities for the two SNPs HaplotypeCaller calls on the alternate locus. We see the AD allele depths much improved for ALTALT and PAALT. Corresponding to the increase in reads, the GQ genotype quality and the QUAL score (highlighted in red) indicate higher qualities. For example, the QUAL scores increase from 332 and 289 to 2166 and 1764, respectively. We also see that one of the genotype calls changes. For sample ALTALT, we see a previous no call is now a homozygous reference call (highlighted in blue). This hom-ref call is further from the truth than not having a call as the ALTALT sample should not have coverage for this region in the primary assembly. For our example data, tutorial_8017's callset subset for the primary assembly and tutorial_8017_toSE's callset subset for the alternate contigs together appear to make for a better callset. What solution did we apply? As the workflow's name toSE implies, this approach converts paired reads to single end reads. Specifically, this approach takes the processed and coordinate-sorted BAM from the first workflow and removes the 0x1 paired flag from the alignments. Removing the 0x1 flag from the reads allows HaplotypeCaller to consider alignments whose mates map to a different contig. We accomplish this using a modified script of that presented in Biostars post https://www.biostars.org/p/106668/, indexing with Samtools and then calling with HaplotypeCaller as follows. Note this workaround creates an invalid BAM according to ValidateSamFile. Also, another caveat is that because HaplotypeCaller uses softclipped sequences, any overlapping regions of read pairs will count twice towards variation instead of once. Thus, this step may lead to overconfident calls in such regions. Finally, use GenotypeGVCFs as shown in section 4's command [4.7] for a multisample variant callset. Tutorial_8017_toSE calls 68 variant sites--66 on the primary assembly and two on the alternate contig. BWA's postalt-processing requires the query-grouped output of BWA-MEM. Piping an alignment step with postalt-processing is possible. However, to be able to compare variant calls from an identical alignment, we present the postalt-processing as an add-on workflow that takes the alignment from the first workflow. The resulting postalt-processed SAM, altalt_postalt.sam, undergoes the same processing as the first workflow (commands 4.1 through 4.7) except that (i) we omit --max_alternate_alleles 3 and --read_filter OverclippedRead options for the HaplotypeCaller command like we did in section 6.1 and (ii) we perform the 0x1 flag removal step from section 6.1. The effect of this postalt-processing is immediately apparent in the IGV screenshots. Previously empty regions are now filled with alignments. Look closely in the highly divergent region of the primary locus. Do you notice a change, albeit subtle, before and after postalt-processing for samples ALTALT and PAALT? These alignments give the calls below for our SNP sites of interest. Here, notice calls are made for more sites--on the equivalent site if present in addition to the design site (highlighted in the first two columns). For the three pairs of sites that can be called on either the primary locus or alternate contig, the variant site QUALs, the INFO field annotation metrics and the sample level annotation values are identical for each pair. Postalt-processing lowers the MAPQ of primary locus alignments in the highly divergent region that map better to the alt locus. You can see this as a subtle change in the IGV screenshot. After postalt-processing we see an increase in white zero MAPQ reads in the highly divergent region of the primary locus for ALTALT and PAALT. For ALTALT, this effectively cleans up the variant calls in this region at chr19:34,391,800 and chr19:34,392,600. Previously for ALTALT, these calls contained some reads: 4 and 25 for the first workflow and 0 and 28 for the second workflow. After postalt-processing, no reads are considered in this region giving us ./.:0,0:0:. :0,0,0 calls for both sites. What we omit from examination are the effects of postalt-processing on decoy contig alignments. Namely, if an alignment on the primary assembly aligns better on a decoy contig, then postalt-processing discounts the alignment on the primary assembly by assigning it a zero MAPQ score. To wrap up, here are the number of variant sites called for the three workflows. As you can see, this last workflow calls the most variants at 95 variant sites, with 62 on the primary assembly and 33 on the alternate contig. For WDL scripts of the workflows represented in this tutorial, see the GATK WDL scripts repository. To revert an aligned BAM to unaligned BAM, see Section B of Tutorial#6484. To simulate reads from a reference contig, see Tutorial#7859. Dictionary entry Reference Genome Components reviews terminology that describe reference genome components. The GATK resource bundle provides an analysis set GRCh38 reference FASTA as well as several other related resource files. As of this writing (August 8, 2016), the SAM format ALT index file for GRCh38 is available only in the x86_64-linux bwakit download as stated in this bwakit README. The hs38DH.fa.alt file is in the resource-GRCh38 folder. Rename this file's basename to match that of the corresponding reference FASTA. For more details on MergeBamAlignment features, see Section 3C of Tutorial#6483. For details on the PairedEndSingleSampleWorkflow that uses GRCh38, see here. See here for VCF specifications. Thanks for the compliment and thanks for bringing this up. I just want to confirm, are you also using BWA v0.7.15? Thanks @RMulet for pointing this out. I corrected this in the body of the tutorial on this page. I should mention here that the matching WDL script remains correct and does not include the extraneous fasta file in the command. You are welcome! Sorry for not replying to the previous comment before, but I did not receive any notification. I guess it's no longer necessary, as it has been modified now, but I am indeed using BWA v0.7.15. Could you please explain in more details what exactly is done by SetNmAndUqTags ? SetNmAndUqTags is a new tool. I can refer you to two sources of information. (1) Although the website documentation does not yet reflect the tool specs, you can call them up from the commandline with the -h option. Fixes the UQ and NM tags in a SAM file. This tool takes in a SAM or BAM file (sorted by coordinate) and calculates the NM and UQ tags by comparing with the reference. Note the NM tag values will be incorrect at this point and the UQ tag is absent. Update and addition of these are dependent on coordinate sort order. Specifically, the script uses a separate SortAndFixTags task to fix NM tags and add UQ tags. Phred likelihood of the segment, conditional on the mapping being correct. If MergeBamAlignment is given a query-group sorted BAM, then the tool omits addition of the UQ tag. Also, the NM tag values will be incorrect. In this situation, SetNmAndUqTags corrects the NM tag values and adds the UQ tags. I hope this clarifies your question. The Documentation about that tool is still missing at the picard docs . Hi @EADG, we have on our to do list to update the Picard docs. I hope you have enough information from the thread above to continue with your work. Actually @EADG, as of Picard v2.7.0, SetNmAndUqTags is now SetNmMdAndUqTags. Fixes the NM, MD, and UQ tags in a SAM file. This tool takes in a SAM or BAM file (sorted by coordinate) and calculates the NM, MD, and UQ tags by comparing with the reference. -h                            Displays options specific to this tool. I=File                        The BAM or SAM file to fix. Required. O=File                        The fixed BAM or SAM output file. Required. Newer versions of Picard going forward will now copy over AH tags as well as allow you to specify which @SQ lines header--from the uBAM or aligned BAM--to use in the merged output. Newer versions of GATK will allow disabling of the BadMateFilter in HaplotypeCaller and thereby enable calling variants in GRCh38 alternate contigs after BWA-MEM alt-aware alignment without having to strip the 0x1 SAM flag off of reads. Can I replace the "Mark Duplicates" part of best practices with 4.1-4.5 and follow the rest of best practices after mapping reads to reference? The best practice germline workflow for GRCh38 is outlined in https://gatkforums.broadinstitute.org/gatk/discussion/7899/reference-implementation-pairedendsinglesamplewf-pipeline. My workflow above is missing BQSR (because the reads are simulated to have no errors) and you will need to include this step in your pipeline. This tutorial is meant to illustrate the effects of alt-aware alignment to a reference with alternate haplotypes. I'm sure there are inefficiencies that could be done better for real analyses. For example, you should already have in hand a uBAM that you can add read groups to and you would not need to revert your alignment. I'm told that the decision to include MergeBamAlignment in your workflow depends on your downstream analyses. Thanks for your reply! I will rerun my scripts with the recommended pipeline. I was wondering whether there is any pipeline proposed for RNA-seq differential expression analysis which takes into account these alt loci on GRCh38 ? We are using hisat2 on a regular basis in the lab, so we would like to find a pipeline to use the new reference and take into account these alt loci, preferentially with hisat2. The GATK focuses on variant discovery and not differential expression. We are currently developing, in GATK4, functionality towards differential copy number variant detection. However, these are not applicable to detecting differential RNA expression. I've heard that HISAT2 is an aligner that can incorporate given variants into its graph-based assembly. This certainly sounds promising towards taking into account ALT loci in GRCh38. I am not familiar with the details of using HISAT2 as our workflows recommend STAR for RNA-Seq alignment and BWA for DNA-Seq alignment. If you are interested in calling variants from HISAT2 alignments with GATK, then you should first test to see if the output format is compatible with the GATK workflow for germline variant discovery. I am actually interested in knowing what the result of this is. Keep in mind there are limitations to calling variants from RNA-Seq data compared to DNA-Seq data. P.S. You can just call me @shlee. If you insist on adding a title to my moniker, I'd prefer Dr. Thanks. Actually @ac67479, I wonder if you'd be willing to share your HISAT2 alignment data (assuming non-human) and I could check it out on my spare time. We have an FTP upload, with instructions at https://software.broadinstitute.org/gatk/guide/article?id=1894, if you would be willing. @shlee Why new bundle is composed with ALT contig fasta file, not using GCA_000001405.15_GRCh38_no_alt_analysis_set.fna.gz? using "no alt" fasta is more easy way, isn't it? I guess you totally missed the point. The reasons for using alt contig version are listed in this tutorial, but if you feel strongly about using the non-alt version, you can certainly do so. Thanks for this very useful and comprehensive article! Assume for a second I needed a unified approach for processing samples to BAM, which leaves the decision to call variants on the ALT contigs or not for later. In that case 0x1 removal can't be part of that pipeline, because it changes the BAM files irreversibly. My question is: is it always safe to include k8 bwa-postalt.js, i.e. can the output be used for "ALT calling" (after 0x1 removal) and "non-ALT calling" (no further processing needed)? Someone will get back to you soon. In GATK4, you can disable a filter and call on the alt reads just as if you had removed the pair flag. This filter is disabled with the --disable-read-filter MateOnSameContigOrNoMappedMateReadFilter option. See my March 5 reply to KlausNZ at https://gatkforums.broadinstitute.org/gatk/discussion/comment/46649#Comment_46649. The decision to include k8 bwa-postalt.js processing is left to researchers. In the tutorial, I tried to illustrate the effects of including it or not, to illustrate two modes in which our production pipelines were run at some point. As I note in the tutorial, our production currently generates data WITHOUT the k8 bwa-postalt.js processing and only makes calls on the primary assembly. Again, it is left to researchers to decide what type of calling is best for their research aims. I see that this section is still in beta for over a year, and the hg38 bundle in the google drive is labelled as "v0". I am just wondering if this protocol is still the correct one, or whether there are updates. Specifically, I would like to use the mapping with ALT reads to tumor exome data in order to detect somatic variants, and I want to know whether this protocol is fitting. This document is the one to use. I will check and see why it is in beta, but there is no updated/new document that I am aware of. is BWA postalt processing obligatory when alt-aware alignment is done? if we skip postalt processing - does mutect's disable of MateOnSameContigOrNoMappedMateReadFilter still make sense? As I say above in other replies, whether or not you perform post-alt processing is up to you and will depend on your research aims. Perhaps you will find skimming this post helpful. "As of this writing (August 8, 2016), the SAM format ALT index file for GRCh38 is available only in the x86_64-linux bwakit download as stated in this bwakit README. The hs38DH.fa.alt file is in the resource-GRCh38 folder"
I just want to know is there any ALT index available for current genome version (GRCh38p12) ? Is there anyway to create that ALT index file on our own? If yes, could you please share the detail steps. Thank you very much, I guess that I should stick with .alt index from hs38DH., I hope to see some scripts or tutorial which show us how to make .alt index for any version of GRCh38. Additionally, I would like to ask another point: Are those 3 mapping processes applicable for Mutect2 somatic variant calling, is there any difference? In particular, did I need to perform "remove 0x1 flag" step before running Mutect2? I hope to see such scripts too. One of the features of the .alt file that might be of interest to you is that it is in SAM format and therefore parseable with samtools. Whichever mapping process you decide on, just note that you should try to match the analysis pipeline for your panel of normals samples, if you are using a PoN. did I need to perform "remove 0x1 flag" step before running Mutect2? For GATK4 this is no longer necessary as you can now disable the read filter that I was trying to hack around with the "remove 0x1 flag" step. In GATK3 you could not disable this read filter. In GATK4 you need only specify --disable-read-filter MateOnSameContigOrNoMappedMateReadFilter in your command. I am a bit lost with altalt.sam appers first time in this tutorial only when we talk about postalt processing. Is that just same file as altalt_bwamem.sam? Do I run bwa-postalt.js on alighned sam right before MergeBamAlignment? In the tutorial, yes, postalt processing is run immediately after BWA MEM alignment and before MergeBamAlignment. I'd like to mention that since writing this tutorial I've learned that the 1000 Genomes Project , when postalt processing GRCh38 alignments, does NOT perform MergeBamAlignment. Thank You @shlee . does MergeBamAlignment conflict with postalt alignments or 1000 genomes project just does not comment such choice? @sergey_ko13, the project makes no comment and I do not know of anyone who has investigated. I suspect there are some implications for pair assignments. If you find out exactly what is the difference, it would be great for you to share. @Adam_U0, I moved your question to https://gatkforums.broadinstitute.org/gatk/discussion/13055/question-on-article-8017-mapping-reads-to-grch38. Thanks for the article! May I ask three questions? 1. if the Broad public pipeline does not do ALT calling, why does it specially says "Reference genome must be Hg38 with ALT contigs"? 2. do you know if the current variant annotation tools would be able to annotate variants in those ALT contigs? 3. Are most of the ALT contigs in MHC regions? If so, I suppose variant calling on ALT contigs would be beneficial for study of immunity-related diseases. Do you know any actual studies where variant calling on ALT contigs is used? Happy New Year, @shlee ! Happy New Year to you too @blueskypy! Last I checked, which was a while ago, the Broad GRCh38 pipeline performs alt-aware alignment but does not perform post-alt processing. Alt-aware alignment still requires a reference with ALT contigs. As far as I'm aware, GATK4 tools, including Funcotator, should be able to annotate variants in ALT contigs given annotation files such as GTFs that contain information for features in the ALTs. If you find this is not the case, please let us know. I believe there are HLA-specific aligners and callers out there to aid in the study of such loci. Heng Li comments on HLA typing in the BWA repo at https://github.com/lh3/bwa/blob/master/README-alt.md#hla-typing. Also, check out his thoughts in the Preliminary Evaluation section and the Problems and Future Development section. If you know of any studies where variant calling on ALT contigs is used, please do share. Thanks so much, @shlee ! I'm working on WES. If the target regions of the capturing kit do not include ALT contigs, and I apply -L target_regions in BQSR, I suppose the bam files after BQSR won't contain off-target mapping. It won't make sense to apply this alt-mapping and calling in this case, and in general to targeted seq where targets do not include ALT contigs. Is my understanding correct? hi, @shlee, could you please take a look at my question? I really appreciate! Take a look at Geraldine's post here. As you can see, the GATK Comms Team has reorganized and also expanded (doubled in size in fact!). So, I just wanted to point out that I'm not a part of the Frontline Support Team, who started fielding forum questions since last summer. Sheila was the singular point person previously and so I helped her as I could as the only other Comms member on the GATK side of things. Now I am actually a part of the User Education Team, who develop and write content. I am still active on the forum, but these days typically at the request of the Frontline Support Team for help with some question or another. So I hope you understand I'm not on the forum as much. This is due to the time-pie constant. Even if you ping my handle personally, it is the Frontline Support Team who will typically answer. So, the new world order is you have to wait until someone from the Frontline Support tickets your question for response. One tip is that you'll have a better chance of someone answering your question quickly if you post to a new thread, instead of to an existing article. I apply -L target_regions in BQSR, I suppose the bam files after BQSR won't contain off-target mapping. It won't make sense to apply this alt-mapping and calling in this case, and in general to targeted seq where targets do not include ALT contigs. Is my understanding correct? For your first question, please apply base recalibration to the entirety of your data, including your unmapped reads. 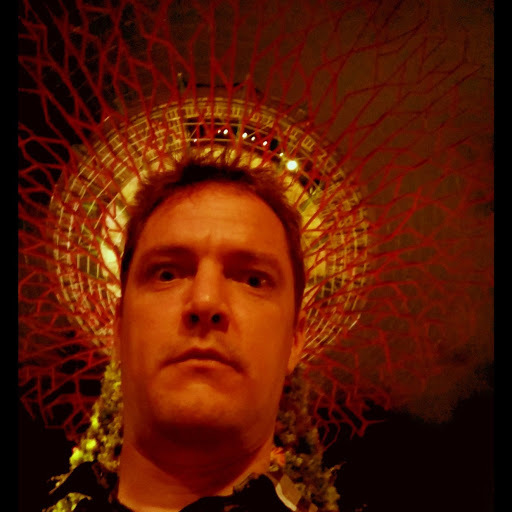 I think you will find the gatk-workflows repo's gatk4-exome-analysis-pipeline helpful here. If you dissect the pipeline, you see BQSR is performed on the entirety of data, not just on targets. Can you rephrase your second question? It's not clear to me what you are asking. Thanks so much @shlee! I'll address my future questions to the Frontline team. In addition, there are some processing steps, such as BQSR, that should be restricted to the capture targets in order to eliminate off-target sequencing data, which is uninformative and is a source of noise. Based on your comment, seems the above statement is wrong. I was wondering that, if it were right, after BQSR, the bam file does not contain reads mapping to ALT contigs anymore if the target region does not include ALT contigs; then there is no need to apply this ALT-mapping and calling any more either. btw, @shlee, does gatk4-exome-analysis-pipeline perform ALT-mapping and calling? It makes sense to me as the linked article states to generate the BQSR report from just the padded targets. However, it's my understanding you should apply the base recalibration itself (the second step) to the entirety of the data. I only quickly glanced at the gatk-workflow's exome pipeline and it appeared to me that both steps used all data, presumably because (unchecked) the workflow limits downstream variant calling to the targets. I only took a quick glance so I could be mistaken. I hope @bshifaw can clarify. These pipelined workflows are meant to represent GATK recommendations. BQSR keeps all reads as its function is to adjust base quality scores. To reiterate, you should have all the reads you started with. Again, your second question is unclear to me. I think the above point about keeping all reads should help you. hi, @shlee, thanks for the quick response again! I really aprpeciate! I've posted a new question for the Frontline team. If the mapping or variant calling is limited to targets only, and the target.bed has only the primary chromosomes, i.e. does not include ALT-contigs, there is no need to apply the approach (ALT-mapping and calling) in this article. is it correct? It's my understanding exome target kit targets are empirically designed. If a kit's targets have been calibrated to work well across populations so that there is some acceptable level of capture across the board no matter the sample, say 95%, and this sort of cutoff suits your research project and your project's samples, then you STILL need to perform alt-aware alignment if you are in GRCh38. Please see the figure I made for section 4 of Blog#8180. The white reads are secondary alignments and GATK ignore these. If your analysis is limited to the primary assembly, you should perform your own due-diligence for your project aims for the value-add of the additional post-alt processing as there are differences in the data (that Tutorial#8017 outlines) even on the primary assembly, e.g. the handling of reads that map to decoys. I touch upon these briefly in section 6.2. The alternate contigs represent alternate haplotypes of corresponding regions of the primary assembly. It is not unreasonable to assume that exome target kits accommodate some extent of the alternate haplotypes, which can be common in the population, and in this case you might find it preferable to analyze the corresponding target region on the alternate contig instead of the primary assembly. You could do a quick back-of-the-envelope calculation on how much of your target kit's target baits has corresponding alternate regions by performing a liftover of your bait intervals. You can do this at the UCSC LiftOver site, the NCBI remap site and using Picard LiftOverIntervalList. Last I conversed with Heng Li on this topic, the recommendation is to perform all and compare as there are differences between the methods. P.S. That your target intervals are limited to the primary assembly is an artificial construct of past methods and resources. To take full advantage of all the improvements GRCh38 brings, you should request from your target kit manufacturer corresponding intervals for the alternate haplotypes. hi, @shlee, thanks again for the reply! I'm interested in both primary chromosomes and ALT-contigs, the problem is the target.bed from those commercial exome capturing kits, e.g. Agilent SureSelect V7, specifically designed for hg38, only contains chr1-23, X, Y, M, no other contigs. Therefore, to not use ALT-mapping and calling, I can use a version of hg38 with no ALT contigs based on Heng Li's blog. But to use ALT-mapping and calling for WES, I wonder if the method 2 in my post is the option?